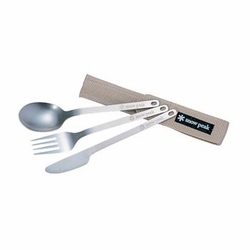 Snow Peak Titanium Silverware features the convenience of a full set of utensils - spoon, fork and knife - without the weight. At a mere 1.8 ounces, the entire set weighs less than most single utensils. Titanium is extremely durable and tasteless.